I don't know about y'all, but I sure like to wear jammie pants all day and eat soup when it's cold outside. 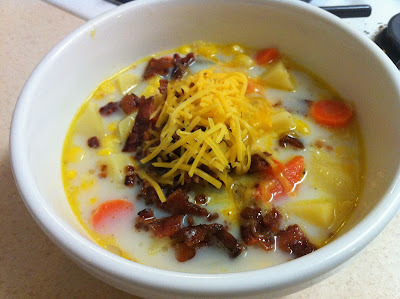 Recently this corn chowder did the trick. The recipe is originally from Family Circle. I modified it some. Add carrots, celery and onion, cook until softened. Put veggie mixture you just cooked into a crock pot, with the potato cubes and add bay leaf, dried thyme, and paprika. Cover, and cook on HIGH for an hour and a half, or until potatoes are cooked through. Then, stir in corn and milk, cover and cook for another hour on HIGH. Make sure everything is heated through. Use a potato masher to mash the soup together. Cook some bacon, chop it up, and top each bowl with bacon and some shredded cheddar (I added that). Thanks for such helpful post. You are so kind that you think for the people! I recommend to use portable wind meters for weather report so that cold weather can't be life taking or dangerous to them.